A Follow-Up: Are You Frustrated with Facebook? Were you wondering if you were the only person out there frustrated with Facebook? 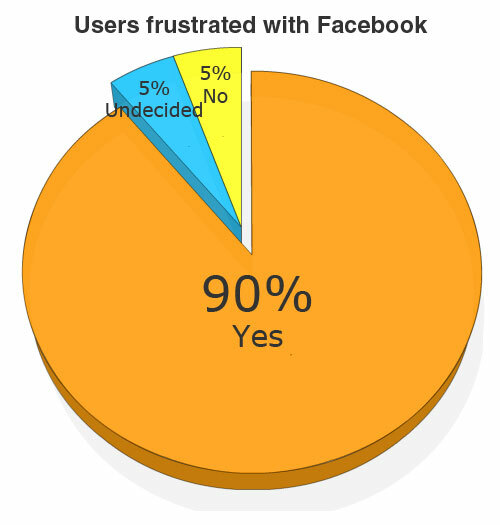 Can you guess the top reason why 59% of respondents are frustrated with Facebook? You made your voices heard. It is finally here, our follow-up article to Are You Frustrated with Facebook. I am so delighted to share our findings with you today. Let me start off by saying a big thank you. You are all amazing. I am so honored to have such wonderful readers. I have loved reading all of your responses. One of the things that stood out to me the most, was how hard working you all are. Thank you for taking the time to respond to my questions, and thank you for sharing your expertise. 90% of the respondents reported that they had been frustrated at one time or another with Facebook. 5% reported that they had yet to make up their mind. 5% reported that they were not frustrated with Facebook. So, if majority rules, then, yes, you are frustrated with Facebook. What I found interesting wasn’t just that you were frustrated with Facebook, but why you were frustrated. I broke down the reasons for why you are frustrated into 4 different groups. What would you guess was the top reason why people are frustrated with Facebook? 59% of people who reported being frustrated with Facebook said they were because analytics and lack of reach. Many of you wrote about how you work so hard on your posts and the people who like your page never see them. 17.5% said that they are frustrated because of Facebook’s constant changes. 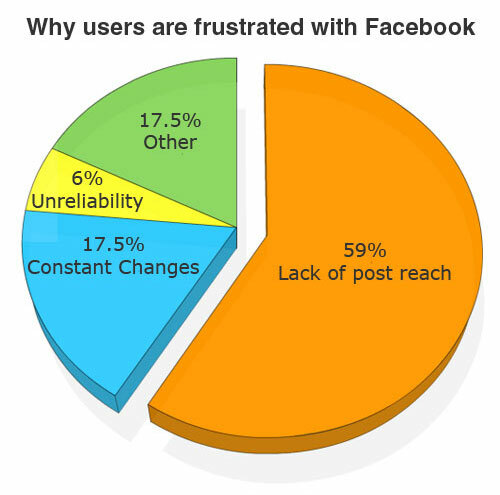 6% of those frustrated cited Facebook’s unreliability. 17.5% of the responders said that they understood the frustration and at times have felt frustrated with Facebook. However, this group had a little something extra to say. They understood that Facebook is a business looking to make money. They use Facebook as well as many other social media sites to promote their blog articles. In other words, they don’t put all their eggs in one basket. Lastly, they stated that Facebook is a free platform. They explained that you can choose to pay to promote posts if you want, but it remains a free platform. While 90% reported being frustrated, only 5% reported that they had given up on Facebook completely. Another 5% did report that if something didn’t change, then they too, would be giving up on Facebook. Another thing that shouldn’t be ignored is that 5% of you reported success in paying for ads/promotions on Facebook. I wish I had a better answer, but the truth is that only you can decide if Facebook is worth it for your company. I would love to hear your thoughts on this study. Don’t forget, next Tuesday I’m starting a video blogging series. Do you have any recommendations for me? I would love to hear your thoughts on video blogs. Have a wonderful week everyone. Christine, outstanding follow up to the original post “Are You Frustrated With Facebook.” Interesting to note that while 90% of the respondents are frustrated, only a small percentage have or would abandon Facebook altogether. It is definitely a love/hate relationship–fantastic analysis! I am on FB all the time, I post my blog post and manage my pages and I am mostly frustrated as the majority with the reach. I am not into all the behind the scene things at this time, and I too get frustrated with the changes b/c of that, it is time consuming to get use to the format over and over again. But I still enjoy it for socializing with friends I do not have a business and I understand those that do their frustration are view in a different light. Your are so right, the social piece of Facebook is unmatched and it is a great way for businesses to connect with other businesses. Thank you so much commenting. You make a great point, that potential 1 billion active monthly users has to be considered when deciding whether or not Facebook marketing is right for your company. Thank you for commenting. 🙂 I think your word sums it up for many. Thanks for sharing. I’m pleased to see that I’m not the only one frustrated with Facebook. My biggest frustration is that my business facebook page, can’t do what my personal profile facebook page can do. What parts of your personal page would you like to see in your business page? I agree that Facebook can really annoying at times BUT … and it’s a huge But – we can use it for free and to be honest what other marketing resources gives you all that Facebook does for FREE? It sounds like you would fit into that fourth grouping. 🙂 Thanks so much for sharing. Interesting to read the foloow-up as I participated in your original research. Thanks for putting it all together. YOU are vey hard working too!!! I’m certainly part of the love-hate gang! Thank you so much! You are so sweet! This was a really fun set of articles to do. Thank you for lending your voice and being apart of the whole process. I’m the same way, it can be so consuming. Time management becomes more important than ever when marketing on Facebook. Thank you so much for sharing. Thanks for the follow-up post! I’m in the “don’t put all your eggs in one basket” group. You get what you pay for, and Facebook is a free platform. I think (in my humble opinion) the reason the frustration is there is that the algorithms changed. You used to have a much bigger reach (for free) and now you don’t – which is frustrating. A social media strategist recently told me – the only thing you own is your website. If you rely on any social media platform (Twitter, Facebook, G+, etc.) to generate business – what will you do if they close down the site? Use these platforms to funnel people to your website, blog, etc. As this is the only thing you can control. You bring up a really important point, utilizing social media to promote your website and blog. I think you are really smart to do that. Thank you for sharing. I have been frustrated with Facebook since day 1, but to be honest I do not pay attention to this anymore. Indeed, I get better results with twitter. 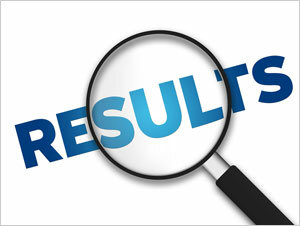 That’s great to hear that you are getting good results from twitter. Thank you so much for sharing. I was curious to read the follow-up post, thanks for the wonderful details, Christine! I think many of us are comfortable and decide to continue on, because we started with the personal accounts and we like to use Facebook, don’t you think? It’s a really important aspect, we don’t want to start all over after years of effort that we’ve put in. Your right, it sounds like most people will continue to use Facebook. Thanks for sharing. You’ve done such a great job with the graphics and just stating the facts. Let people decide! Well put. We don’t have a choice but to use this VERY popular platform. I personally feel that most of the changes they make are for the better, so we have to adjust and start paying to increase reach if needed. I like to compare Facebook with the radio: It’s free to use provided you have the reception device but if you want to be heard of, you must pay!